Awnings Direct is an award-winning, family owned and operated traditional awning shop that has been serving the Catskill, New York area since 1989. Awnings Direct was hired by Provence Restaurant and Wine Bar to build a patio awning that would serve a dual purpose: protect their customers from the sun and elements while dining al fresco, and increase the overall seating capacity of Provence. 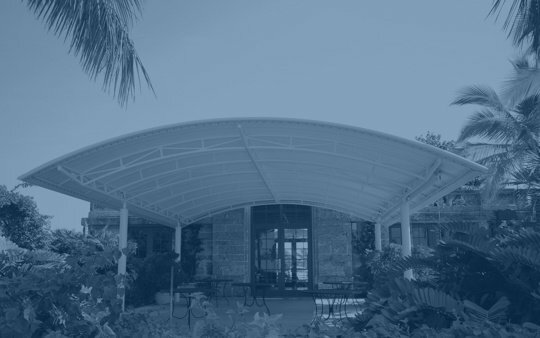 Additionally, Provence wanted a restaurant-style canopy with a natural, canvas, look that would provide commercual quality durability while complying with fire-retardant policy. Herculite had just what they were looking for, and the Herculite Natura® NT7746 Coastal Blue fabric was chosen by Awnings Direct. Herculite Natura® is a high performance vinyl textile featuring the look and feel of woven canvas on both sides. It is waterproof, fire resistant (CSFM Title 19, NFPA 701, ASTM E84 Class A, M2), and dimensionally stable (no shrinkage, stretch, sagging, or pocketing). The blue canvas proved to be the perfect fit for the French and Mediterranean restaurant. The attractive blue Herculite Natura® awning, sitting atop three white pillars, instantly became the most noticeable and best looking sign within the whole outdoor shopping center. Provence placed its name, in an elegant white font, along the lower flap of the beautiful coastal blue canopy. A can't miss invitation to dine. In addition to drawing more eyes to the restaurant, the enlarged outdoor seating space has increased Provence's revenue by a substantial 30% during the summer months. Herculite Natura provides Provence's customers with just the right amount of shade and UV protection to dine comfortably. 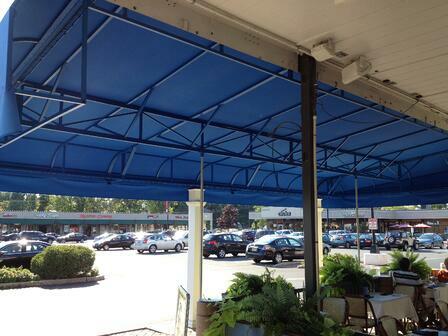 Customers can now enjoy themselves on the patio from lunch to happy-hour to dinner, rain or shine, thanks to the Awnings Direct partnership with Herculite. Interested in learning more about Herculite's Natura® awning fabric? Fill out this form to request a quote or fabric sample, or you can call us directly at 800-772-0036.